Perched on the rocky point of Agate Island, I could make out the towering cliffs of nearby Talbot Island. Ten minutes later, they were gone. Another ten minutes passed, and the cliffs returned only to disappear again as the fog patches came and went with the gentle breeze. 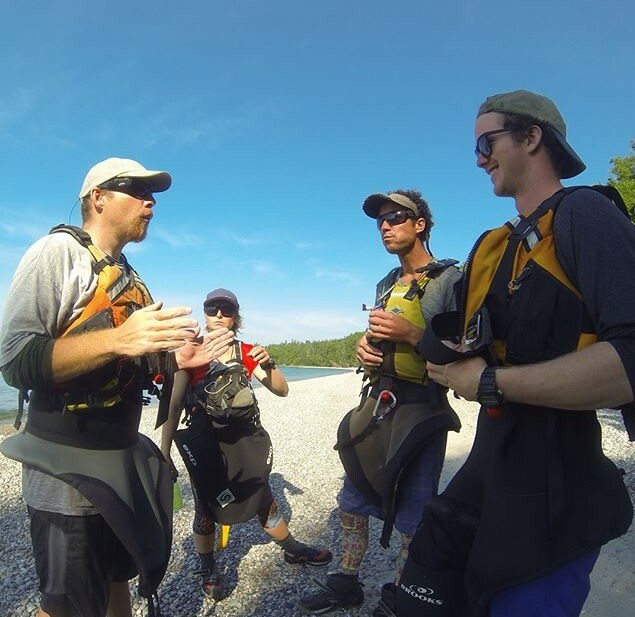 We were midway through a nine-day sea kayak trip from the tip of the “Sleeping Giant” peninsula to the fishing village of Rossport. We had arrived last afternoon, crossing the Nipigon Strait with little trouble. My maps are scratched with notes of “Danger!” “Waves!” “Wind!” “Caution!” at key points from guides before me. The strait was one of them. We were now in the relative shelter of the massive St. Ignace Island, camped among the islands dotting its southern shore. Each unique island is rich with history, geology and biodiversity. The trio of Agate, Talbot and Paradise Islands are some of my favourites on Lake Superior. Our route would take us beneath the towering cliffs of Talbot Island’s north shore. Passing in the shadow of the overhanging rocks brings a reminder of the relative scale of geological time: bare marks on the rocks note where pieces the size of large trucks have broken off and crashed into the waters below. A look down to the crystal-clear bottom shows exactly where these chunks have fallen. They may have tumbled centuries ago but the fresh marks look like it could have just happened. Reading into the perilous history of lightkeepers on the island will amplify that feeling. The “St. Ignace Lighthouse” on Talbot Island was home to the first lighthouse on Lake Superior. Built in 1867, a white wooden tower on the east end with three lamps served as a beacon to ships passing through the shoal-filled, often foggy waters of the archipelago. The lighthouse was short-lived, abandoned in 1872. The tragic stories of the individuals who maintained it during its lifetime earned it the name “The Lighthouse of Doom”. In its brief operating existence, the St. Ignace light claimed the lives of all three keepers. In mid-December of 1867, the lone keeper William Perry closed up and left his post in an open-sailboat. He headed west, towards the Hudson Bay Company post in Nipigon to wait out the winter. Lake Superior is notorious for its early winter storms and Perry never arrived. The following spring, his boat and body were found washed ashore. Thomas Lamphier and his Ojibwe wife filled Perry’s vacancy. In most recent writings on the topic, his wife is referred to nothing further than “Mrs Lamphier”. To avoid meeting the same fate as Perry the couple brought sufficient supplies to bunker down and remain at the light station for the winter. Tragedy struck when Thomas Lamphier suddenly dropped dead. With the ground frozen, his wife had no way to bury his body. It was too late in the season to leave the island, so she wrapped her husband in a canvas cloth and tucked the body into a crack in the rock. She survived the winter and was picked up by a passing group of Ojibwe travellers that she desperately flagged down. Her hair had been jet-black when she was seen the autumn before; the stress and grief of that desolate winter caused to turn snow-white. Andrew Hynes took over as the final lightkeeper on the doomed island. He managed it until autumn of 1872 when he packed up to sail west for Fort William, one half of what is now Thunder Bay. Like many men before him, he was deceived by a window of clear weather. Once on the water, an autumn storm kicked up, sending him off his path. A 90-kilometre journey took 18 days, and when he washed ashore at Silver Islet, he was delusional; he died shortly after landing. After Hynes’ death, the Canadian Coast Guard decommissioned the deadly lighthouse. Across the Great Lakes, lightkeepers’ jobs were eventually rendered obsolete as automation technology advanced and GPS systems became more common. Many of the lights remain but the buildings are being left to fall back into the earth. The only evidence of the lighthouse’s existence on the island is the faint outline of a rough and decaying foundation. Thomas Lamphier’s grave is still marked at the end of a rough footpath on nearby Bowman Island, behind the abandoned fishery. It has been hinted that part of the seemingly cursed history of the keepers could relate to the decision to build on an island which is sacred to the local Ojibwe. Many spaces where dramatic cliffs meet the water have been identified as sacred. 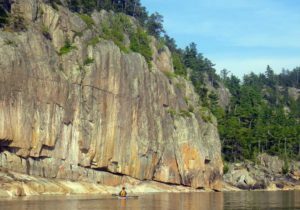 Examples of this include pictograph sites at along the Nipigon River and at Agawa Rock. Talbot Island also bears a striking resemblance to “Devil’s Warehouse Island”, a name christened by missionaries in an attempt to dissuade First Nations from participating in traditional ceremonies and practices at the site. Cursed or not, a tobacco offering at sights such as these acknowledges those who travelled the waters before us. Naturally Superior Adventures runs two trips past Talbot Island; by Sea Kayak and a musical Journey by Voyageur Canoe. 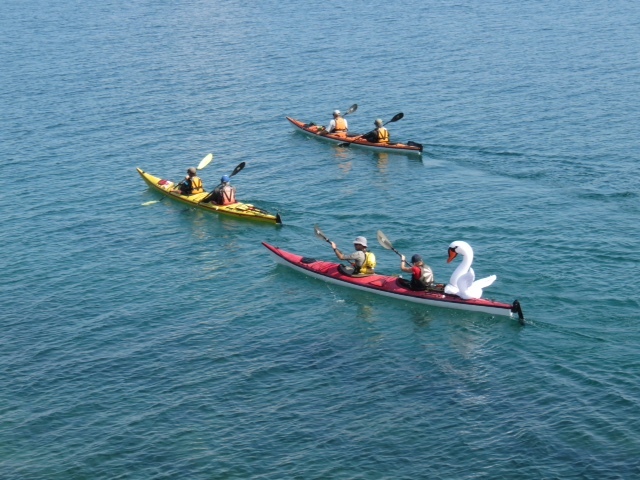 You can’t get away from watching the weather if you paddle on the Lake Superior coast. When I guide sea kayak trips or take pleasure trips by canoe, I am constantly observing the clouds, the wind, the texture of the water, and the colour of the sky. I’ve lived on Lake Superior all my life, yet more often than not I am at a loss when it comes to predicting the weather. 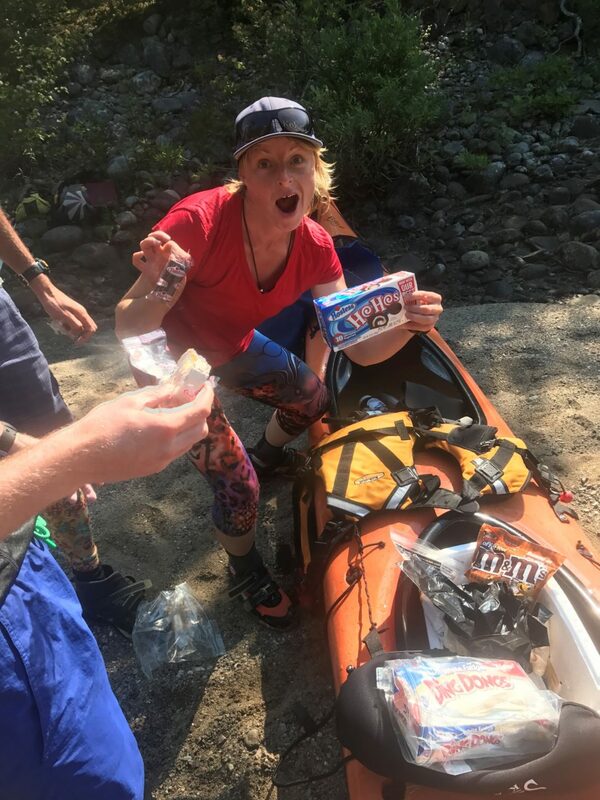 About the only failsafe mantra I know is a familiar one amongst sea kayak guides: It’s better to be on shore wishing you were on the water than on the water wishing you were on shore. That being said, there are some great online resources and reference books we use while teaching Paddle Canada sea kayak skills courses. But first, here are some basic observations that hold true most of the time. Wind shifts – In general, a backing wind (shifting counterclockwise) foretells deteriorating weather and intensifying winds; a veering wind (shifting clockwise) predicts improving weather and decreasing winds. Barometric pressure – A barometer is a valuable tool in predicting the weather. Unfortunately, Environment Canada no longer reports air pressure in its marine forecast, however sometimes you can catch it on land-based forecasts, which are occasionally available on VHF marine radio weather bands. If barometric pressure changes more than three millibars in a span of three hours, expect strong winds and changing weather. Note, 1013 mb (or 101.3 kpa) is the dividing line between high pressure (generally fair weather) and low pressure (generally foul weather). Water – A good last-minute predictor of strong winds is the presence of a dark blue band of water along the horizon line. Usually this means it’s time to get to shore and batten down the hatches. Wind, weather & waves: A guide to marine weather in the Great Lakes region (out of print) A PDF version is available online. Navigation, Sea State and Weather: A Paddler’s Manual by Michael Pardy, JF Marleau, Andrew Woodford and Piper Harris. Available for purchase from SKILS. Lake Superior rests in the 1.1-billion-year-old depression left behind when plate tectonics pulled the North American continent apart. Known as the “Midcontinent Rift System, this geologically diverse area holds some of the world’s greatest mineral deposits. Unlike the lower Great Lakes, whose underlying bedrock has largely been buried beneath the sediments of saltwater seas, magma-borne granites and gabbro intersect with volcanic basalts in the Lake Superior basin, creating lodes of copper, veins of gold, silver and platinum, pockets of uranium and vast quantities of iron ore. The namesake red, volcanic rock of Rhyolite Cove, Lake Superior Provincial Park. From Marquette to Manitouwadge, Houghton to Hemlo, these valuable minerals have drawn prospectors and built communities throughout the Lake Superior basin. 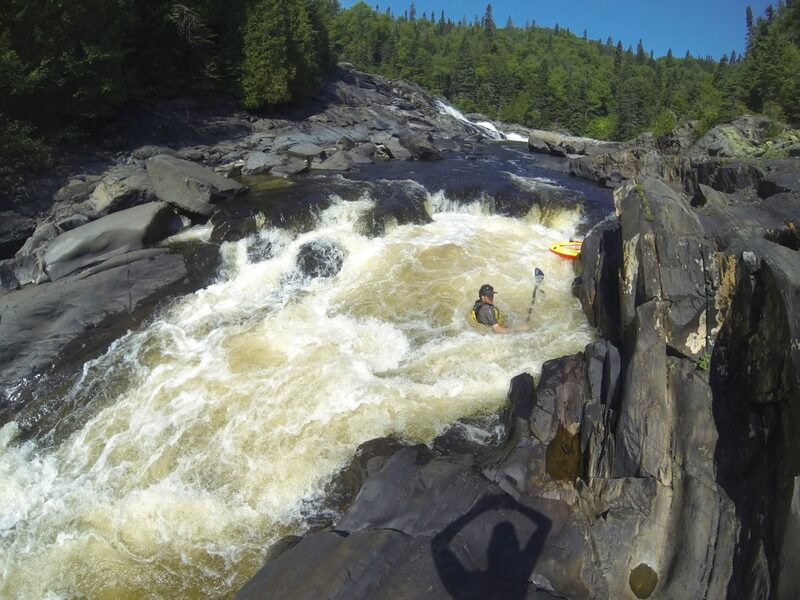 As paddlers, we are drawn to Superior’s rocks for aesthetics alone. 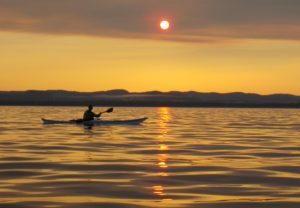 Here are three features you may encounter on a guided sea kayak trip with Naturally Superior Adventures. Raised beach – In the wake of the last ice age, the landscape has been slowly bouncing back from the weight of the glaciers in a process known as “isostatic rebound.” On Lake Superior’s shores, this process is manifest on raised beaches, where ascending terraces of baseball- to melon-sized cobbles represent former high-water lines as the shoreline has rebounded since the glaciers retreated 9,000 to 10,000 years ago. Bill Mason’s classic National Film Board production Rise and Fall of the Great Lakes demonstrates this and other ice age impacts on Lake Superior. Where to see it: Old Woman Bay (Lake Superior Provincial Park), Cobinosh Island (Rossport area), Detention Island (Neys Provincial Park), Otter Island (Pukaskwa National Park). Raised beach in Pukaskwa National Park. Diabase dike (intrusion) – Occur where faults in the underlying geology has allowed volcanic material known as “diabase” to flow, creating a formation known as a dike. Sometimes, these formations appear as sinuous lines of jet-black rock snaking through lighter coloured rocks. 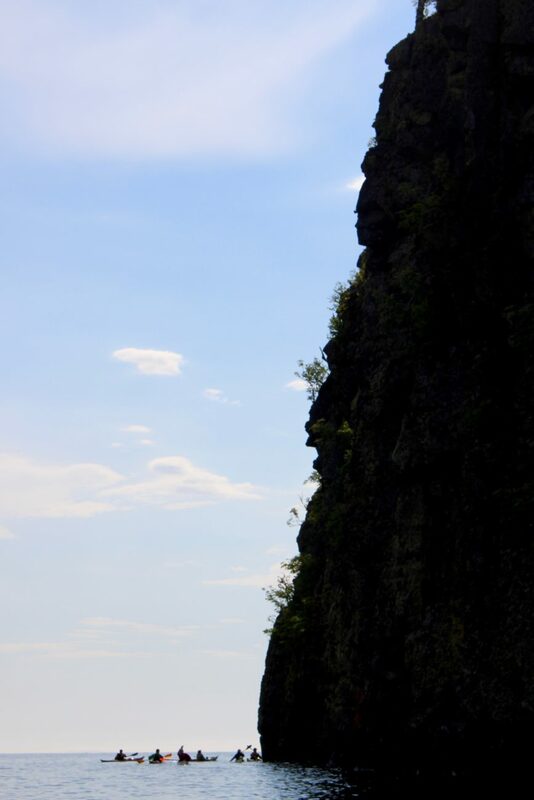 Differing rates of erosion in diabase (soft) and granite (a hard, igneous rock) often creates sheer-sided canyons, such as the dramatic cleft in the rock near the Agawa pictographs. Where to see it: Simpson Island (Lake Superior National Marine Conservation Area), throughout Pukaskwa National Park, Agawa Rock trail (Lake Superior Provincial Park). Diabase dikes are visible at Old Woman Bay, Lake Superior Provincial Park. Jacobsville Sandstone – Like icing on a cake, this reddish, grainy rock (formed when sand sediments fused together 900 million years ago), overlays portions of Lake Superior’s volcanic and igneous foundation, particularly on the southern shores of the basin. Sandstone quarries produced the stalwart “brownstone” used to construct lighthouses in Michigan and Wisconsin and the canal buildings in Sault Ste. Marie, Ontario. Where to see it: Channel Island (Rossport Islands), Grindstone Point (Lake Superior Provincial Park), St. Mary’s Rapids (Sault Ste. Marie). To learn more, pick up a copy of Roadside Geology of Ontario: North Shore of Lake Superior by E.G. Pye. 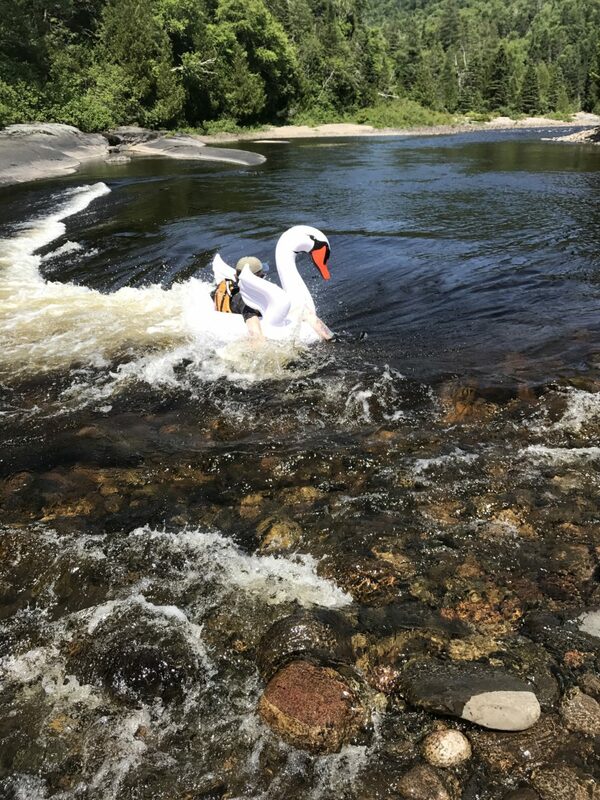 Does Superior still shine “like burnished silver?” Join Naturally Superior Adventures this summer on a seven-day sea journey through the Group of Seven’s Heritage Landscape. Click here to find out more. 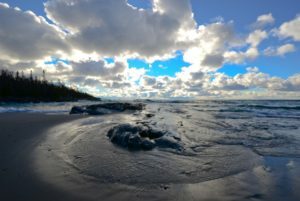 The north shore of Lake Superior was a remote paradise for the Group of Seven, the artists whose landscapes established a uniquely Canadian style of painting. The painters gradually extended their sketching missions north from their base in Toronto, discovering near-north wilderness areas like Algonquin and Killarney and then venturing north of Sault Ste. Marie on the Algoma Central Railway. With each journey, the artists’ enthusiasm for the Northern Ontario scenery heightened. In 1922, A.Y. Jackson discovered Port Coldwell, a tiny fishing village on the north shore of Lake Superior, west of present-day Marathon. With no roads servicing the area, Jackson arrived by way of the Canadian Pacific Railroad. As the story goes, the artist had to sweet-talk the engineer into slowing down the train and then leapt out while the cars were still moving. The village was nestled between steep grades and the engineer worried that the train wouldn’t have the power to make the ascent out of the village from a full stop. The cemetery at Port Coldwell. Port Coldwell was named after the Scottish foreman of a CPR blasting crew in the 1880s. Once the railway was complete, the village turned its focus on Lake Superior. Rowing and sailing tiny wooden dories, fishermen headed offshore to set nets for lake trout. In 1915, the Nicol brothers established a fishery here to compete with the Booth Fish Company, which for years held a Lake Superior monopoly. 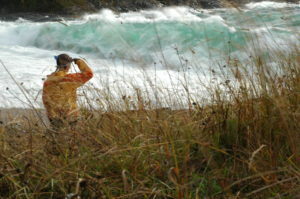 It was with these hardscrabble fishermen that Jackson likely first travelled outside of Coldwell’s fjord-like harbor and viewed the open coast. Wilson Island campsite, Lake Superior National Marine Conservation Area. Jackson’s fine canvases from Coldwell are overshadowed by Harris’ haunting series of Pic Island paintings, which represent some of his finest work. Harris captured the island’s stunning natural architecture beneath Lake Superior’s all-encompassing sky. Paddlers will recognize the spotlight sunrays of Harris’ 1923 classic Lake Superior—a common phenomena foretelling strong winds and changing weather.